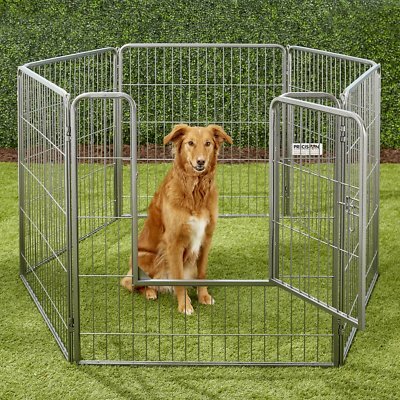 The Versatile Kennel that's sure to make an impression! The Courtyard Kennel is perfect for pet owners looking for an outdoor dog run or an indoor exercise pen. It's unique design and accessories allow complete versatility in configuration, use and storage. Each box contains six 38 inch height, 3 foot wide panels, one of which has a built-in gate for easy access to the pet. The panels are constructed of durable, rust-resistant galvanized steel with a decorative silver crackle finish. The set also contains a set of long and short removable corner pins. 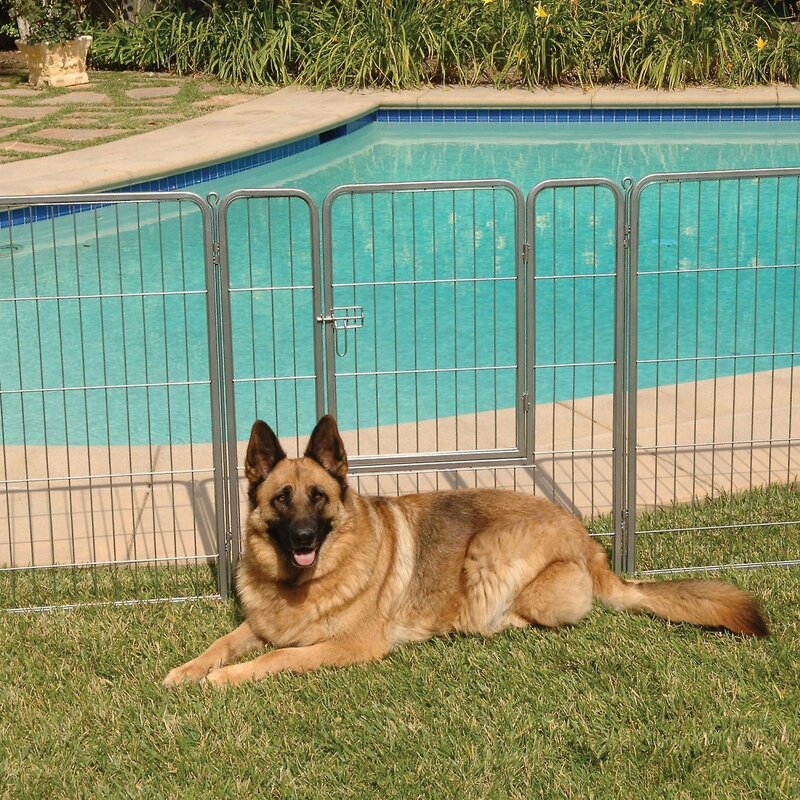 The long pins stake the kennel into soft ground, and the short pins can be used to assemble the kennel on hard surfaces. 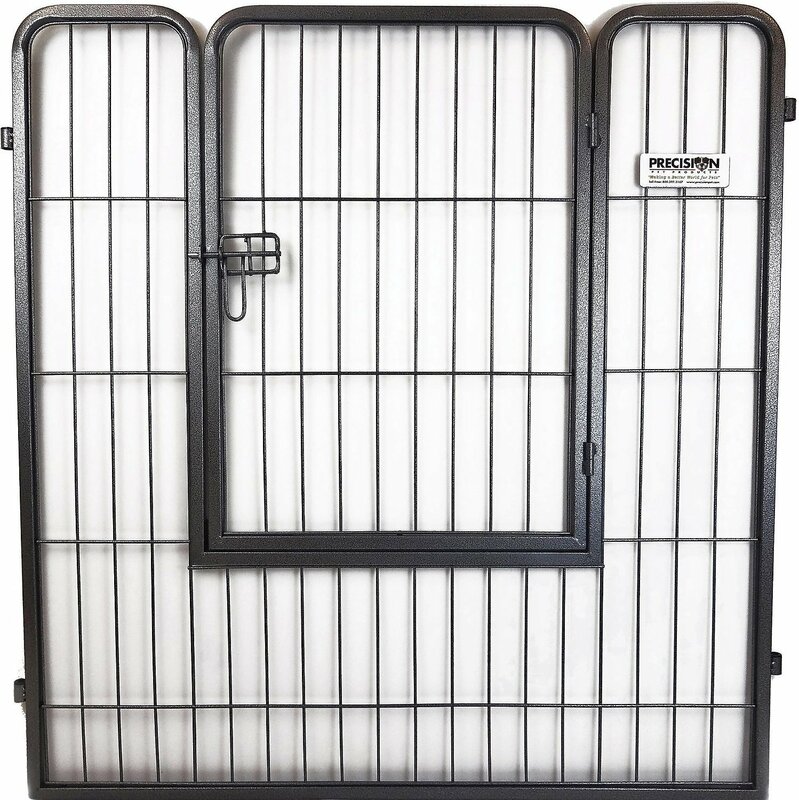 The pins slide-down design allows for quick assembly with no other tools required, and they allow for panels to be easily added or removed to adjust the size and configuration of the kennel. 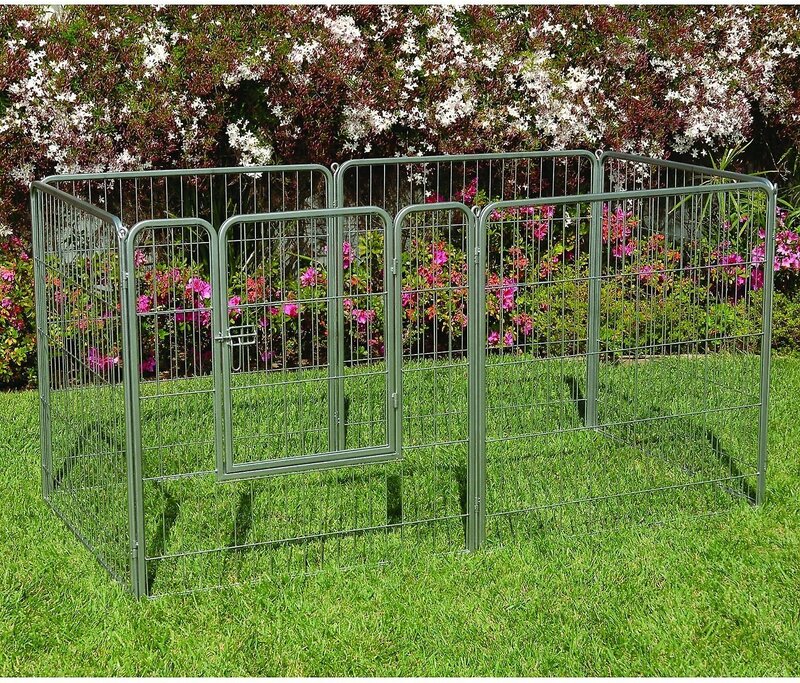 By removing a pin, the Courtyard Kennel can be easily transformed to a portable 18 foot fence. And, since the panels can be disassembled flat for easy storage. Keeps pets away from danger and gives them a "yard" of their own. (5) panels, (1) panel with gate, set of long pins, set of short pins. HAZARDS TO ANIMALS: For safety, remove all collars and leashes before allowing pet to enter pen. In order to prevent excessive wear or to prevent damage to floors (when used indoors), we strongly suggest the use of some type of protective tarp or mat. Do not use harsh detergents or abrasives. This product has a long lasting finish to protect from rust and to resist soiling. To clean, use mild, soapy water and a sponge or soft cloth to wipe away stains. Rinse and dry thoroughly. Join panels by sliding pins down through the shaft channels of both panels. Make sure both panels are facing the same direction so that shaft channels align properly. After not having a puppy for 12 years, we decided to get a new hunting dog as our old girl was becoming deaf. 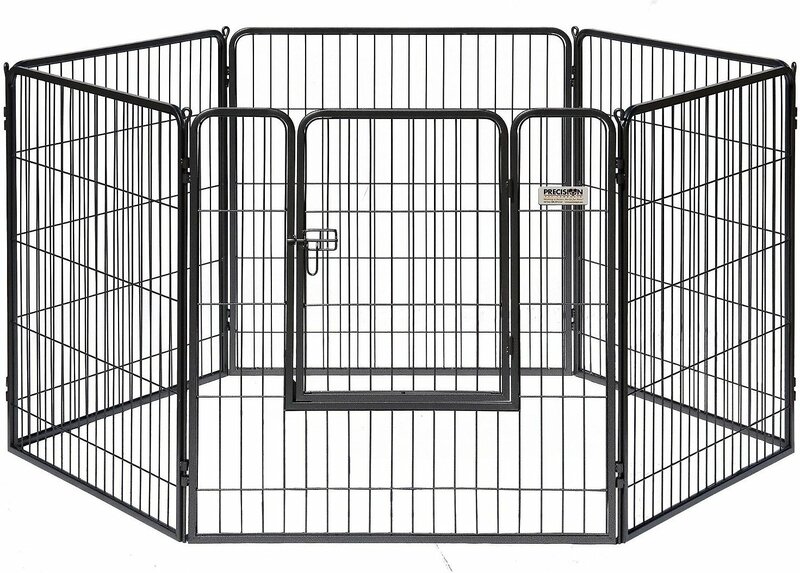 Although we have a fenced yard, this little pen was perfect for when the little one had to be confined when we took quick trips to the store, etc. It also works as creating a nice barrier between the new pup and the old girl so they could get acquainted. The pen is sturdy and easy to put together and the fact that it is expandable with the purchase of extra panels is a plus as well as transitioning to a fence if needed. Well worth the money! I have ordered from Chewy numerous times and this is the first time I was unsatisfied. I received the box on time although it was opened and some of the contents spilling out. The connecting rod holding two of the panels together was bent beyond use,(nearly in half). The connecting piece with the gate was broken, as one of the welded pieces had been broken off. The gate is unusable as it is however I don't necessarily have to use that piece as I'm using the panels as a barrier. This may have been the shipping companies fault but still, for the price I paid I was unhappy. Great pleasant service and faster than lighting. Products great. I have several pens bought long time ago. These pens are a headache To put together. My new pen is the same size and so much easier to put together. Old pen I needed a wrench and lots of patience. My new pen was a breeze. Simply drop a rod through the eye bolts and done. This is a great pen. We bought two and put them together to make a larger play area under the trees. Sturdy and easy to assemble. Our Frenchie is very nosy and this contains her, yet room to play with her toys safely outside. Super pen for our dog. Easy to put together and configure. Did not expect this awesome quality. Teddy is 10 lbs. Sturdy enough for larger dogs too. The pen is good. The only issue is that the latch can be opened by any slightly intelligent dog. It arrived with 2 bent bars and the box was in bad shape. Most of the kennels for puppy exercise are very flimsy compared to this one. I bought 2 and put together to let my litter of puppies run outside and it seems to work very well. I like that the pins pull out so you can carry it to another place more easily. I think it would be quite small to use for an adult dog unless a very small breed.